Here are the scorecards from the first eleven years of the 21st century involving County Championship fixtures betweens Durham and Yorkshire. Belatedly, Durham were acquiring the ascendancy not just in some of these contests but in English county cricket itself. As for the white rose, the Tykes continued to be as erratic as they had been since their golden era of the 1960s. During this era: Yorkshire 5 wins, Durham 6 wins, 7 draws. Durham versus YORKSHIRE; at Chester-le-Street; 7-9 June 2000; YORKSHIRE won the toss. Michael Vaughan was trying to earn himself a home test match debut, and this 94 knock would have helped his cause. YORKSHIRE versus Durham; at Headingley; 7-10 July 2000; YORKSHIRE won the toss. This was the first occasion that Durham finished a match against Yorkshire having achieved more points in the contest. YORKSHIRE versus Durham; at Headingley; 30-31 May and 1 June 2003; Durham won the toss. 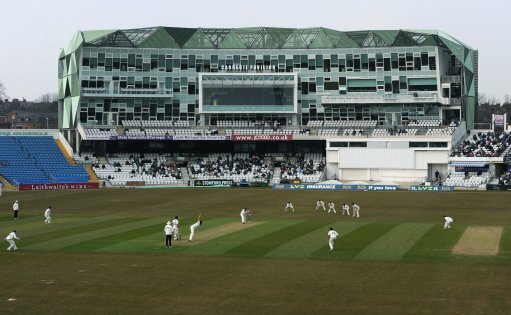 Only Dawson and Richardson reached double figures in Yorkshire's second innings. Durham had finally defeated Yorkshire! Durham versus YORKSHIRE; at Chester-le-Street; 15-18 July 2003; YORKSHIRE won the toss. Durham completed a double whammy in 2003 against the white rose county by recording a hard-fought home victory. Durham versus YORKSHIRE; at Chester-le-Street; 8-10 June 2004; YORKSHIRE won the toss. The Australians, Jaques, Lehmann, and North were all amongst the runs as the visitors won by a cricketing landslide. YORKSHIRE versus Durham; at Scarborough; 1-3 September 2004; Durham won the toss. This fine win was a personal triumph for Gareth Breese who took ten wickets and made a fifty in a Botham-esque effort. Durham versus YORKSHIRE; at Chester-le-Street; 20-23 May 2005; YORKSHIRE won the toss. Chris Silverwood rescued Yorkshire as he bludgeoned 80 off 66 balls. Both teams came close to victory and to defeat! YORKSHIRE versus Durham; at Scarborough; 24-27 August 2005; Durham won the toss. Only a total of seventy-three overs were possible on the first two days of this weather-interrupted stalemate. Durham versus YORKSHIRE; at Chester-le-Street; 14-16 July 2006; YORKSHIRE won the toss. Durham's two innings' scores were almost identical as were the slightly unlucky batting efforts of Dale Benkenstein. YORKSHIRE versus Durham; at Headingley; 20-23 September 2006; YORKSHIRE won the toss. Darren Lehmann climbed into the Yorkshire history books as each team narrowly avoided relegation in this season finale. YORKSHIRE versus Durham; at Headingley; 25-27 April 2007; Durham won the toss. England bowlers Steve Harmison and Matthew Hoggard collected many wickets while Yorkshire still won with ease. Durham versus YORKSHIRE; at Chester-le-Street; 23-26 May 2007; YORKSHIRE won the toss. Jacques Rudolph amassed 190 runs, but this occasion was dominated by a great performance from Otis Gibson. Durham versus YORKSHIRE; at Chester-le-Street; 14-16 May 2008; Durham won the toss. Harmison and Onions plundered lots of wickets and Michael Di Venuto hit a big century in this one-sided encounter. YORKSHIRE versus Durham; at Headingley; 29 June-1 July 2008; Durham won the toss. England test bowler Liam Plunkett produced a fine all-round display as Yorkshire were outclassed by the champions-elect. Durham versus YORKSHIRE; at Chester-le-Street; 22-25 April 2009; Durham won the toss. Di Venuto and Onions both tormented the Tykes yet again, but champions Durham may regret not declaring a bit earlier. YORKSHIRE versus Durham; at Headingley; 10-13 July 2009; Durham won the toss. Durham had been outplayed in the first half of this contest, but Di Venuto and Mustard both revived the visitors. YORKSHIRE versus Durham; at Headingley; 27-30 April 2010; YORKSHIRE won the toss. Only 45 overs were possible on the third day - not that Durham were complaining, as they were second best this time. Durham versus YORKSHIRE; at Chester-le-Street; 16-19 August 2010; YORKSHIRE won the toss. Michael Di Venuto carried his bat in Durham's first innings, but Yorkshire defied the odds to reach the tough target of 299.